Pots crowd the shelves in Sylvia March's living room. There's a white cylinder with an emphatic zig-zag blue-clay inlay, a delicate blue and white teapot, a tea bowl with a wild grass design. These pieces represent her concentrated work while in Japan in the late 1960s The rugged salt-glazed vases are from a slightly later period, when she was working at the Rochester Folk Art Guild. There is an unusual group of tiny pinch-pots, made between thumb and forefinger, burnished and engraved in traditional Hopi patterns. Some of these were made by Sylvia, some by her daughter, Shannon Fitzgerald, when they studied together several summers ago with a Hopi woman potter. 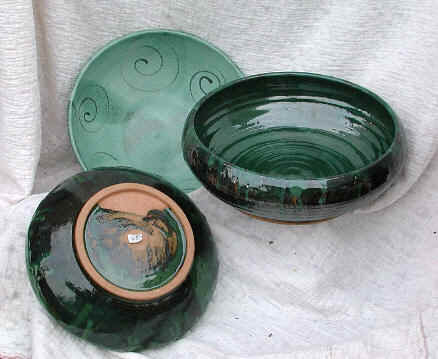 There are large green bowls turned in at the rim, a recent favorite shape. Also on the shelves are two pots made by Sylvia's father. Both Sylvia's parents exerted a strong artistic influence on her work. Walter March was an architect and an artist in many different materials. Born in Germany, he studied in Chicago with Frank Lloyd Wright. Then, returning to Berlin, he designed the Olympic village for the 1936 Games. After fleeing Nazi Germany to the U.S., he worked on the interior of the Chrysler building, and designed summer homes in the Catskills and churches for the U.S. Army in Okinawa. Sylvia's mother, Louise March, came to America as a Fulbright scholar to study art history at Smith, and then ran Steiglitz's Opportunity Gallery in Manhattan. Later in a long life, she founded the Rochester Folk Art Guild, a renowned crafts community in upstate New York. The Marches escaped from Nazi Germany in 1936 and bought a dairy farm in Orange County, NY. Sylvia, the youngest of their five children, was born there. But farming could not pay education bills and the land was sold. Sylvia attended private school in New York and then Sarah Lawrence College. She graduated in 1965 with a double major art and science and spent the next two years teaching earth science and biology at the Spence School. She took evening classes in pottery at the Brooklyn Museum Art School. Then, momentously, she saw in a New York gallery the work of Shoji Hamada, a potter designated as a Living National Treasure in his native Japan. She remembers saying aloud, "A-a-h. I want to be a really good potter." Now she deeply wished to go to Japan to study, to find the calm grounding of the craft. She wrote again and again to the Kyoto City College of Fine Arts, which, she understood, took foreign students, but there was no answer. So, armed with a few phrases in Japanese, she simply went. It turned out that the College accepted only one foreign student at a time. In a stroke of good fortune, the other one was leaving as she arrived. At her first class, the instructor showed her how to make a tea bowl, and said " Now, make a hundred of them " At first the work was hard and slow. But with repetition and persistence, a love for the skill came. In time, she learned to "throw off the hump," making small pots flow one after another from a single large piece of spinning clay. During Sylvia's two years in Japan, she visited the pottery villages where the clay is dug from the fields, raw materials are respected, and the traditions of the craft are passed down from father to son as they have been for hundreds of years. "Beauty and usefulness go hand in hand," she explains "You make a 'one-flower vase' and you know where it is going in your house Rice bowls come to a sharp point at the bottom so that you can get the last grain with your chopsticks." Everything felt connected. She would have liked to live her whole life in Japan. But even though, inside, she "felt Japanese", Sylvia was a geijen, a foreigner. Tall and blonde, people pointed at her. She missed her family, returned to New York. Attending a reunion at Sarah Lawrence, she saw on campus a kiln that a student had built. Sensing an unexpected opportunity, she wrote up a course proposal entitled "Pottery as Traditional Craft of Japan." She then taught at the College for four years, gradually building a studio and a reputation. In 1973 a show at the ABZ gallery in Manhattan "Cross-cultural Innovations" featured pots Sylvia had made in Kyoto and weavings by Kyoko Shimaoka, a Japanese woman working in America. After the years at Sarah Lawrence, she wanted a country atmosphere for her pottery. She found the house in Palisades or, rather, she says, "this house found me" through a two-line ad in New York magazine. Over the next ten years, she concentrated on rearing her two children, Jaime and Shannon Fitzgerald, even home-schooling them for a while, and worked steadily in the studio. 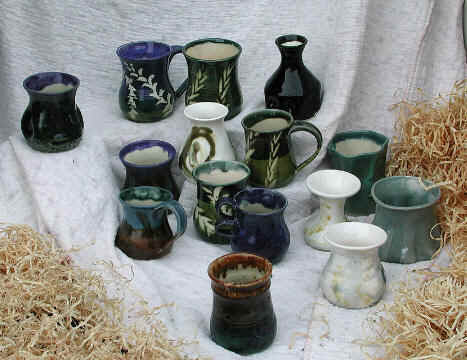 Both the children worked with her and later sold their pieces with hers at her pottery shows. Jaime made " fairy bowls" and whimsical coil pots, Shannon the painted tiles that line Sylvia's kitchen, and clay animal pieces which live all over the County. At the end of this "time of mothering," as she puts it, Sylvia had a very successful show at the Spring Street Gallery in Soho. Most of the pots were large sculptural pieces, deeply carved, while a few were what she calls "utility." The Palisades studio, a converted two-car garage, is a hard-working space with four American kickwheels set under the windows, two Japanese electric wheels, and an electric kiln. There are bins of clay, red and white, and pots in various stages of completion on shelves around the walls. Some of these are Sylvia's own; many are the work of students. Nothing is wasted, as failed pots are broken down and the clay recycled. 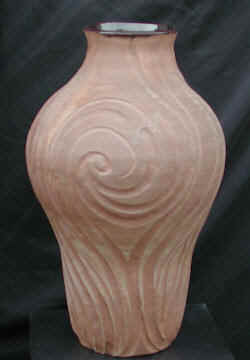 Even the slip-water (clay in very liquid form) is dried and saved. 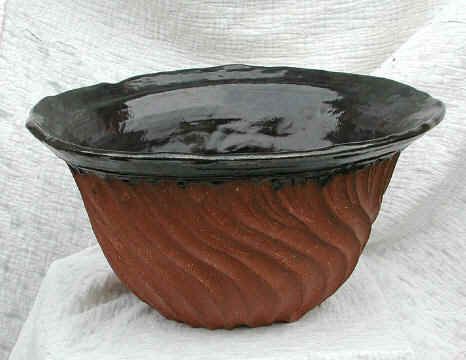 Only firing a pot makes re-using the clay impossible. Sylvia dreams of building a gas-fired kiln, which would make a reduction atmosphere possible (in reduction, combustion in the kiln is incomplete and smoky, so the glazes that result are deep and intense). Meanwhile, she has explored overlapping glazes, producing a mysterious third color. 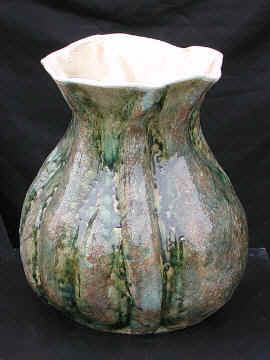 She also decorates her pieces with brushwork, carving and/or wax resist. Sylvia says that she has "always taught pottery," and sharing the creative process of pottery is an important part of her ongoing fulfillment as an artist. An especially important concept is centering, a word which has two related meanings for her. Centering is starting a pot in the perfect center of the wheel. And centering is learning to calm yourself, to relate to your own body, to be steady. Sylvia also emphasizes the value of practice, which she feels is almost forgotten in America today. She teaches in her Palisades studio and also at the Brearley School in New York. Her students range in age from four and a half to 75 years old. 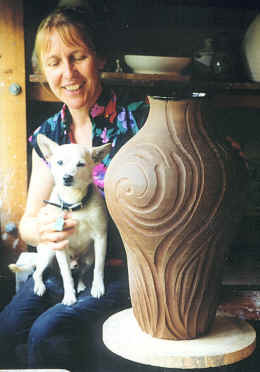 She is happy that some of her long-term students have chosen pottery as a main piece in their lives. But although she loves to teach, the idea of retiring and spending more time creating her own artwork keeps recurring. A paragraph in the "Object Lesson" column of House & Garden, September, '99 ("March creates one-of-a-kind dinnerware inspired by the Japanese and Hopi potters with whom she studied...") has prompted many calls from people interested in her work. She wonders whether she could now devote all her time to her pottery. Smiling, she mentions that on a trip to Japan this past spring, she met Kyoko Shimaoka again. Potter and weaver are planning a joint show, "some time in the next ten years." Sylvia quotes the Toaist dictum: "The beauty of the pot depends on the space inside." 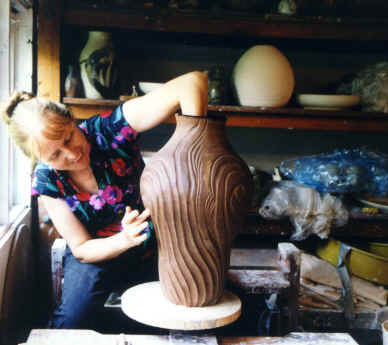 When she embarks on a serious piece of work, she has a picture in her mind of the shape of the piece and a feeling for what she will do with the glaze. But nothing is set; the process is an interplay between control and sensitivity. Out of that an openness appears; a new piece is created. "You have to listen to the clay." Her pieces are signed with an enigmatic three dots creating a triangle, symbolizing her name: MARCH, the third month. This sign was given her by her teacher in Japan.